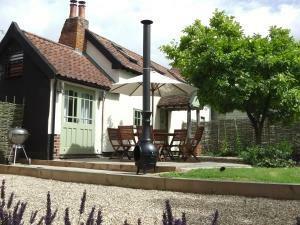 Bakers Cottage01379 668870work Self-cateringBakers Cottage is an award winning luxury self catering holiday cottage for up to 5 people ideal for exploring East Anglia and the Suffolk Coast. Full of character, the large kitchen has a wealth of exposed beams and a wood burner, as well as an original bread oven that can be used to bake home made pizza or bread. A comfortable lounge with HD TV, Netflix and free Wi-Fi. The Snug which can also be used as a third bedroom has French doors opening onto the fully enclosed rear garden, perfect for al fresco dining. Two twin/double bedrooms on the first floor. Please note that the cottage has low ceilings and doorways, steep stairs and the bathroom/toilet is on the ground floor. No smoking or pets.